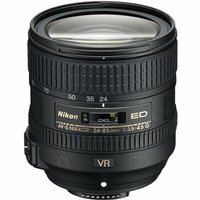 The Nikon 24-85mm f3.5-4.5 AF-S G ED VR Lens is an FX and DX format compatible, 3.5x standard zoom lens that covers a broad focal range from wide-angle up to telephoto. The lens incorporates Nikon's vibration reduction (VR) system that minimises camera shake and allows flexible hand-held shooting by stabilising the image to the equivalent extent of using a shutter speed that is four stops faster. The Nikon 24-85mm f3.5-4.5 AF-S G ED VR Lens features Nikon's Super Integrated Coating which offers superb colour reproduction, a Silent Wave Motor (SWM) for quiet operation and an option to use two focus modes, Autofocus with manual override and manual focus.